Here you find an invitation to share your celebrations and experiences with a broader public. The invitations are in various languages. A Lyon, le treize novembre 2011, une grande marche a été organisée par quelques membres du Comité Interreligieux de la Famille Franciscaine ( les autres étant sur Paris pour la même manifestation qui s’étalait sur trois jours :11-12-13 /11). Un groupe s’est constitué , composé d’une belle diversité de personnes et de groupes religieux ! La marche a débuté, montée des carmélites, à l’amphithéatre des trois gaules, là même où le Pape Jean-Paul II avait annoncé, en octobre 1986, l’invitation faite à toutes les religions, de se retrouver à Assise pour une « journée de prière œcuménique et interreligieuse en faveur de la paix ». Au point de départ la parole était donnée aux chrétiens, en ce lieu combien symbolique ! Catholiques, Orthodoxes et Protestants se sont exprimés, un groupe de jeunes « foccolaris » a chanté leur chant de paix, puis la marche a démarré. Le service d’ordre assuré par des bénévoles, n’a pas manqué de questionner et d’étonner les quelques policiers qui se tenaient aux lieux stratégiques de la route. A chaque étape deux colombes étaient lâchées comme symboles de paix. La deuxième étape, place des Terreaux a fait place à la communauté musulmane. C’est le président du Conseil Régional pour le Culte Musulman qui a fait une belle intervention, suivie d’une prière musulmane. Là, pour la petite histoire, une des deux colombes est repartie, perchée sur le bus , bonne occasion de faire sourire tout le monde. Troisième étape au bord du Rhône où une sorte d’amphithéatre permettait aux gens de s’assoir un peu. La parole était données aux frères bouddhistes ; c’est une jeune femme Vietnamienne qui a exprimé joliment quelques aspects du bouddhisme, et un petit groupe hindou a chanté . Puis, sur la place Bellecour, près de la statue du « petit prince » ce sont nos frères Juifs, en la personne du grand Rabbin de Lyon, qui avaient la parole : un beau plaidoyer pour la paix « le Chalom »qui mène à la plénitude. Les dernières colombes se sont envolées, portant au Seigneur nos désirs de Paix. Enfin, notre marche prend fin, place St Jean, dans la cour de l’école des lazaristes, pour un temps spirituel. C’est le moment de recueillir en nous, tous les fruits de fraternité et de paix de cette journée. de chacune des religions : « Ce que vous voulez que les autres fassent pour vous, faites-le vous-mêmes pour eux. » ainsi que la prière dite de St. François pour la paix. La parabole des quatre bougies est lue et gestuée , puis les responsables religieux prennent les quatre grosses bougies pour distribuer la lumière aux centaines de personnes debout dans la cour. Nous sommes tous invités à élever nos petites flammes quelques minutes en silence. Moment intense de communion ! Puis nous lisons tous ensemble la prière dite de St. François . Pour terminer, un Message de paix, fait par le Comité Franciscain, est proclamé solennellement par tous les responsables religieux présents. Le groupe des musiciens et chanteurs terminent la soirée. Un verre d’amitié, ainsi que des gâteaux ont permis des échanges tout simples. La joie et la satisfaction étaient sur tous les visages, les mercis aussi, et c’est sur que ce soir-là la paix a gagné un peu de terrain, quelques barrières sont tombées et des désirs sont nés… d’aller plus loin, dans la connaissance et le dialogue entre tous les croyants. 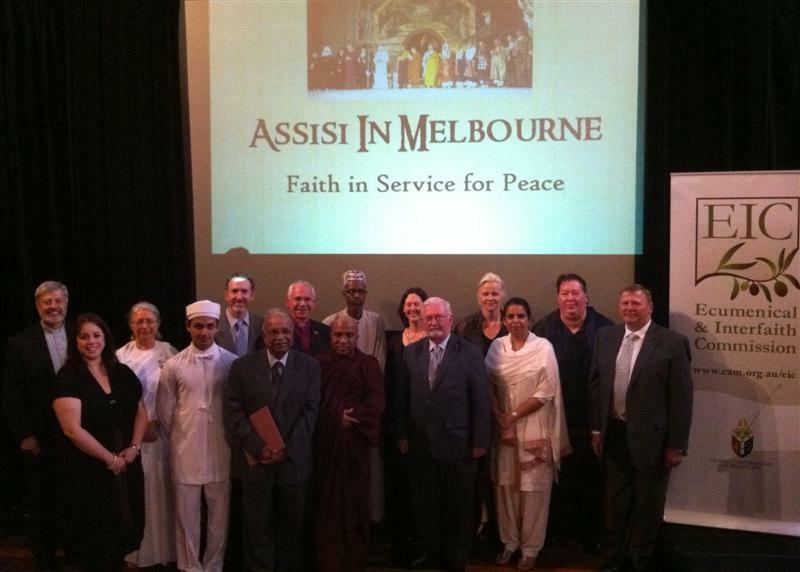 Bernie Thomas OFM assisted in the planning of the Spirit of Assisi service in Auckland Cathedral. Hosted by Bishop Pat Dunn, there were ten denominations represented and approximately 150 people in the congregation. The “Decalogue of Peace” was used as the main focus for the evening. Each religious denomination which included a Buddhist monk, a Muslim Iman, and a member of parliament, was invited to read one of the statements from the Decalogue and then to respond to it with their own style of prayer or reflection. A member of the congregation was invited to give to each religious representative a native seedling which they were invited to plant somewhere as a symbol of our desire for peace and unity. The evening finished with supper. On Oct 27th 2011, the Custody of St. Anthony of Singapore, Malaysia and Brunei celebrated the 25th Anniversary of the Spirit of Assisi at the Home of the Franciscan Friars in the Piazza where it was attended by 300 or more people. The event was graced by His Excellency, the President of the Republic of Singapore Dr. Tony Tan & Mrs. Mary Tan, His Excellency Apostolic Nuncio Archbishop Leopoldo Girelli, His Grace Archbishop Nicholas Chia of the Archdiocese of Singapore and the Respected Religious Leaders of the IRO (Inter-Religious Organisation). Mr Jaafar Ma, a representative of the Muslims from Ba’alwie Mosque, said the gathering was an opportunity for the different religions to demonstrate racial and religious harmony. 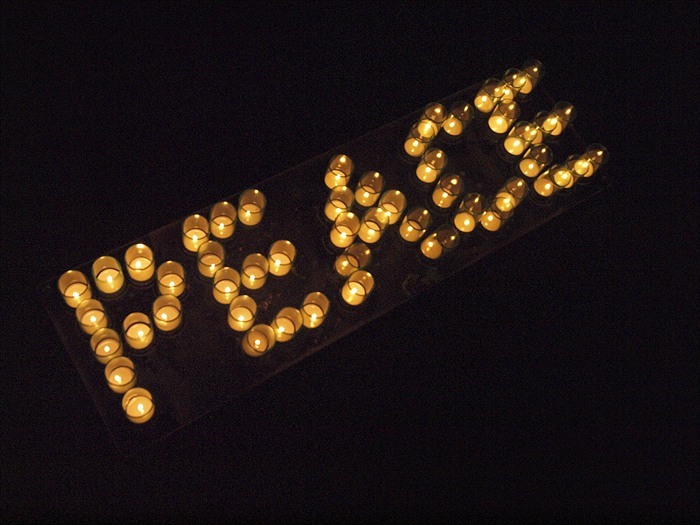 After the Respected Religious Leaders had taken their respective turns to pray in their own faith traditions, they joined in the lighting of candles in the Garden of Peace, where when all the candles were placed together, it read the word ‘Peace’ in four languages of English, Mandarin, Malay and Tamil. The event was concluded with a simple gesture of a sign of Peace with one another. 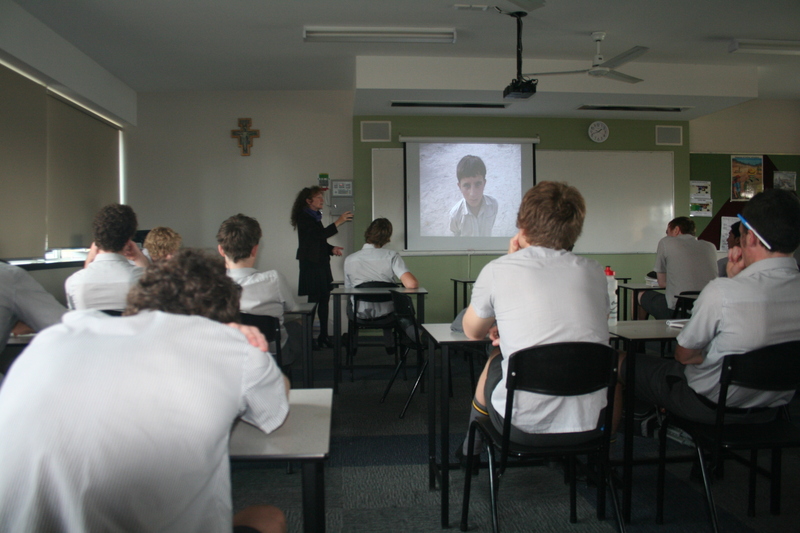 On 27 October Padua College played host to two very special guests as its way of honouring ‘Spirit of Assisi’ Day. 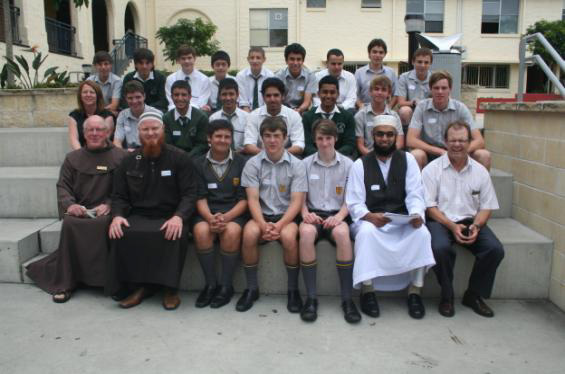 Firstly, a group of Year 11 boys from the Islamic College of Brisbane enjoyed a visit to Padua. The visit began with an interfaith prayer gathering in Little Flower Church where one of the Islamic students read from the Koran in Arabic. John Boyd-Boland OFM gave a short explanation of the significance of the church as a sacred space to Catholic Christians. Matt Hufer OFM spoke about the history and tradition of the Franciscans. The students were guests at a special college assembly where one of them made the call to prayer before the assembly prayer was prayed. They left shortly after the assembly. Their visit was so successful that it will become a regular one each year. Our second guest for the day was Ms Kathy Kelly, peace activist and three times Nobel Peace nominee. Kathy’s visit was sponsored by Pace e Bene Australia. Kathy spoke to at assembly about non-violent peaceful ways of demonstrating. The observance of the 25th anniversary of the Spirit of Assisi Day of Prayer for Peace extended over four days at Saint Peter’s Church and Friary in the Chicago Loop. October 25 Tuesday – The Power of Forgiveness, a film (part one) was shown at 12:15 p.m. in the Saint Clare Auditorium of Saint Peter’s Church. October 26 Wednesday – The Power of Forgiveness, (part two) was shown at 12:15 p.m.in the Saint Clare Auditorium of Saint Peter’s Church. Friars from the Community joined approximately thirty lay people employed in the businesses for this two part formation and education program. A fraternity of the Secular Franciscan Order, which meets regularly at Saint Peter’s, used this as part of its fraternal reflection program during its meeting. – The friary community used the special prayer service for Morning Prayer on this the actual anniversary date. – At the seven Masses celebrated in Saint Peter’s Church on that day the Mass for Peace and Reconciliation or the Mass for the Progress of Peoples was offered. – At 12:15 p.m. Friar Albert Merz, of the Province Peace Center, offered a lecture and reflection on The Seeds of Violence. Friars and approximately thirty others participated in the Saint Clare Auditorium. October 28 Friday – At 12:15 p.m. Friar Albert Merz continued the meditation begun yesterday by a presentation entitled The Seeds of Peace to a similar group as yesterday. In this way several hundred people from various parishes in the Archdiocese of Chicago as well as residents in the city and its suburbs became aware of the Spirit of Assisi. On 1 January 2011, Pope Benedict XVI announced that he wished to commemorate the 25th anniversary of the historic meeting that took place in Assisi on 27 October 1986, at the wish of Blessed Pope John Paul II. On the day of the anniversary, 27 October this year, the Holy Father held a Day of reflection, dialogue and prayer for peace and justice in the world, making a pilgrimage to the home of Saint Francis and inviting fellow Christians from different denominations, representatives of the world’s religious traditions and, in some sense, all men and women of good will, to join him once again on this journey. 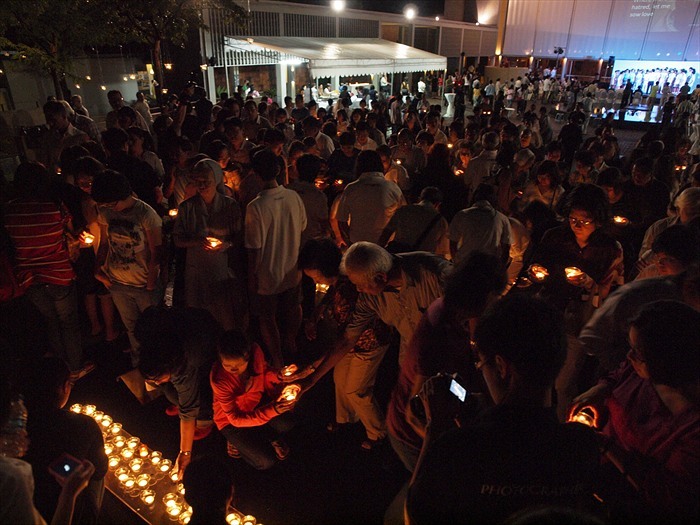 In conjunction with the Holy Father’s Assisi meeting, gatherings also took place in major cities around the world. Here, the Faith Communities Council of Victoria cooperated with the Ecumenical and Interfaith Commission of the Catholic Archdiocese of Melbourne to organise a gathering called “Assisi in Melbourne: Faith in Service of Peace.” The Anglican Diocese of Melbourne kindly made available their historic “Chapter House” at St Paul’s Cathedral for the event. 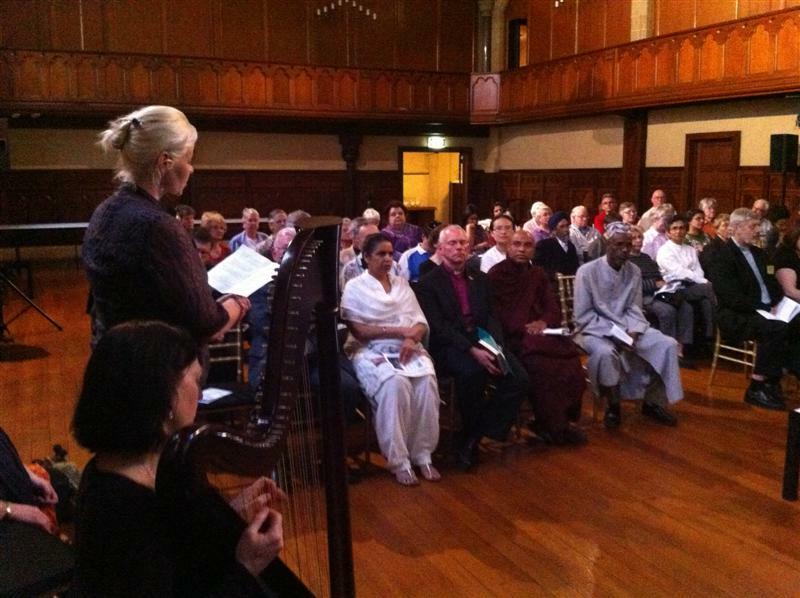 On Sunday 23rd October, sixty members of Melbourne’s religious communities gathered for a one hour ceremony to commit to the service of peace in our city and our world. As we gathered, Cathy Connelly played for us on her celtic harp to appropriately set the tone of peacefulness. We were welcomed by Murray Davies, the chair of the FCCV and by the Dean of St Paul’s Cathedral, Bishop Mark Burton. This was followed by a series of readings and meditations from the twelve religious traditions represented: Baha’i (Susanne Haake), Brahma Kumaris (Christine Westbury), Buddhist (Venerable Horowpathane Sathindriya), Christian (Bishop Mark Burton), Hindu (Pandit Abhay Awasthi), Jewish (Rabbi Shamir Caplan), Muslim (Sheikh Abdinur Weli), Sikh (Ranjit Kaur), and Zoroastrian (Ervad Armin Dumasia). Between each reading, Glenn Sharp played quietly on the sitar. Rabbi Caplan used a verse from the Jewish evening prayers related to the Jewish festival of Sukkoth (the “Feast of Tabernacles” or “Booths”): “May You spread over us a sukkah (tabernacle) of Your peace.” He explained that the value of peace is so great that we pray for it even if it will be like a sukkah, the flimsly and temporary outdoor structures in which Jews live for the eight days of this festival. It requires effort and work to keep it standing and proof against the weather. Many of the readings were read in the original languages of the sacred writings, such as the Koran and the Veda. Bishop Burton surprised us all by reading, beautifully and fluently, the Beatitudes from Matthew’s Gospel in the original Greek! Melbourne Opera soprano, Rebecca Long, then sang for us the “Peace Prayer of St Francis” (“Make me a channel of your peace”) to the accompaniment of the harp. While not by St Francis, this song embodies the spirit of St. Francis of Assisi’s simplicity and poverty and was first published by Pope Benedict XV in L’Osservatore Romano to encourage peace efforts during the First World War. The assembly then voiced together their “Commitment to Peace”, which included rejection of violence and terrorism in the name of religion, mutual respect and esteem between people of different ethnic groups, cultures and religions, fostering the culture of dialogue, forgiveness for past and present errors and prejudices, taking the side of the poor and the helpless, and urging leaders of nations to make every effort to create and consolidate a world of solidarity and peace based on justice. Following the ceremony, the Hindu Society of Victoria provided a generous afternoon tea (of curry puffs and cream cakes!) which allowed those who had gathered to spend a precious and joyful hour in conversation with one another. Ironically, as this was taking place in the Chapter House in Flinders Lane, outside there was tension and some violence in relation to the “Occupy Melbourne” protest. By numerical comparison, our gathering was small, and yet I believe that in “Assisi in Melbourne” there was a true sign for the hope of a future of well-being and peace in our society.